It's a long long read... Get yourself a warm cocoa or a stiff drink. Starting the process will rein in a president who is undermining American ideals—and bring the debate about his fitness for office into Congress, where it belongs. 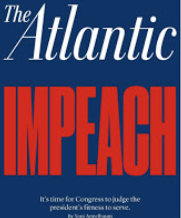 I read editor Jeffrey Goldberg's companion note on this last night (Impeachment: An Argument,) found it interesting on the history and ethos of The Atlantic, about when in their considerable history they have decided to opine political and when not. Nat'l columnist for Phila. Inquirer, DN, and http://Philly.com . In the light of the pushback from Mueller on the Buzzfeed report, it is interesting that there was no denial that the FBI undertook an investigation into whether Trump was a Russian asset. According to the NYT, the investigation was taken over by Mueller. Roll Call - Jan 23, 2019 10:28 AM: A new crop of progressive freshman has been seated on the House of Representative’s investigative committee — signaling future fireworks and higher C-SPAN ratings for its hearings this year. Rep. Alexandria Ocasio-Cortez, D-N.Y., Rep. Rashida Tlaib, D-Mich., and Rep. Ayanna Pressley, D-Mass. — who all tack to the left and have shown an appetite for aggressively challenging the White House and corporate interests — have been tapped to join the House Oversight and Reform Committee, Speaker Nancy Pelosi announced Tuesday night. With Democrats now in the majority, the committee will be able to compel testimony and subpoena documents in order to investigate a range of issues. That includes potential violations of the emoluments clause by President Donald Trump and the child separation crisis. The Committee on Oversight and Government Reform is now the Committee on Oversight and Reform. Jan. 29: A hearing is scheduled on prescription drug prices. Feb. 6: A hearing is scheduled on a campaign finance and lobbying overhaul (HR 1). Feb. 7: A hearing is scheduled with Michael Cohen, Trump’s former lawyer for who has been convicted of campaign finance violations. NOTE Jan. 23, 2019 MSNBC: President Trump’s ex-lawyer Michael Cohen is postponing his house testimony due to “ongoing threats” against his family from Trump. "The interesting thing about Deutsche Bank is they seem to be pretty much the only entity out there willing to lend to the Trump organization," Himes said. Yup. Deutsche Bank is intertwined with anything and everything.